Are you ready to enhance your home’s exterior value with a deck but are unsure of what type of decking is best suited for your property. Azek decks have been built and designed to withstand several types of accidents and wear the outdoor deck takes on. Typically, Azek PVC decking are made of sturdy boards that come in a variety of soft and subtle colors that complement the features around your home and your landscape as well. When purchasing PVC decking, all of the worries that come with any new structure can be locked away and there is an abundance of time for you, your family and friends to enjoy your new deck and the outdoors. The type of material Azek decking is comprised of gives it a long life span. When finished, Azek decking presents a safe and secure structure that is built to withstand all weather elements and survive accidents like spills, leftover grease from the grill and etc. It is also important to understand that this particular type of deck is unlikely to show scratches and/or wear and tear sports. Azek Deck is resistant to both mold and mildew. The plastic structure of PVC decking’s boards make it extremely rare to both mold and mildew. While you may spot these types of hindrances, mold and mildew will not affect the deck. Azek Deck is also resilient to stains. Because of its soft exterior, Azek deck is resistant to spills like barbeque sauce, ketchup, etc. Instead of letting the stains soak in, Azek decking is constructed to repel against the stain and, thus can be easily washed away and cleaned. Azek Deck will not have splits. With PVC decking, the makeup of the plastic material leaves a clean and seek appearance and will not leave your deck looking rigid or become vulnerable to splits. You won’t find scratches on PVC decks. The different components and materials that make up Azek decking will not leave any signs or marks of scratches from kids, pets and/or furniture. Low maintenance deck. Because Azek decking is easily maintained and cleaned and since it does not allow for any spills, stains, harsh weather or chemical elements to affect it, Azek decking requires little maintenance. Additionally, all the materials from Azek decking can be recycled. 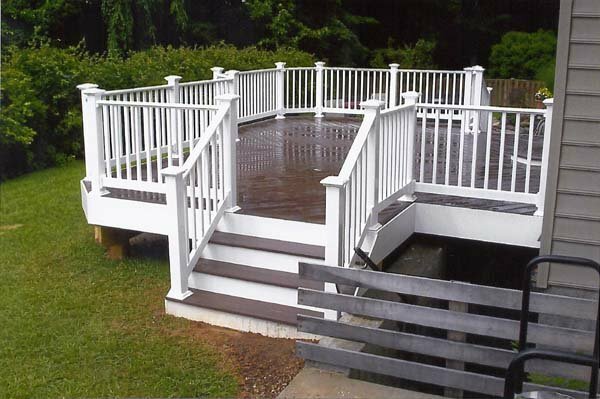 If you have any questions about pvc decking in Baltimore County, please contact Freedom Fence and Home by calling 443-271-6841 or visit our website. You can also follow us on Facebook and Twitter! This entry was posted on Wednesday, December 30th, 2015	at 3:30 am	. Both comments and pings are currently closed.